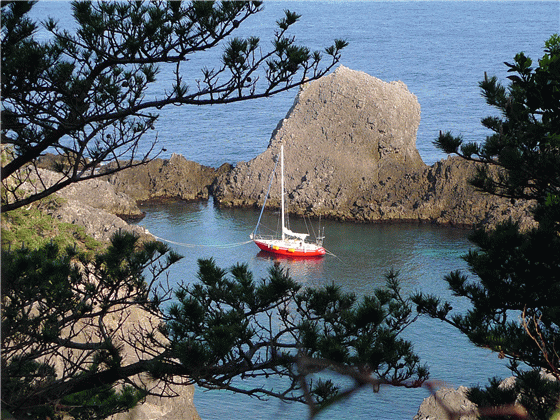 Fukinoe is a most beautiful cove and anchorage for sail boats in Kanto area. 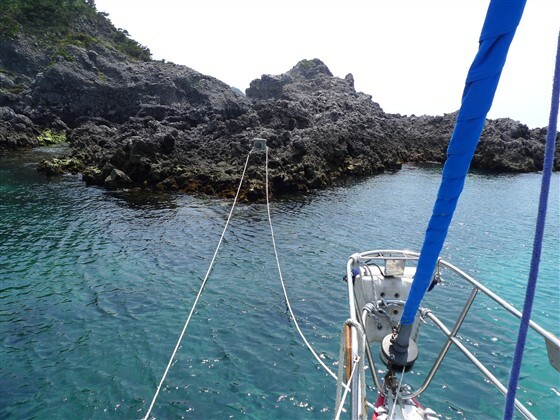 The beauty of the anchorage has distinctive atmosphere, which is different from the beauty in Okinawa. I strongly recommend your anchoring experience in the cove. 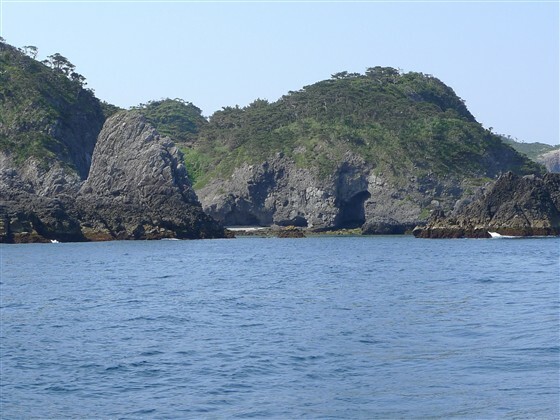 A small tender boat is required, because Fukinoe is a natural cove with no artificial quay. Just a few bitts are built into rocks. To put your dock lines on those bitts, you need a tender to go there. Make two waypoints: 34 20.470N　139 12.5300E and 34 20.150N　139 12.4950E. At the first waypoint, you will have a view of the whole cove to the back. Then, you may move to the second waypoint. I have visited Fukinoe many times. But, only with visual navigation, I was always lost and not able to find the entrance of the cove. In summer time for example, as masts of yachts were seen from outside of the cove, I was able to find the entrance. Without those masts, it is hard to find the entrance. So, please utilize the two waypoints above to move into the cove. At the left side of the entrance, there is a rock being washed with waves. While the top of the rock can be seen above the sea surface, it is hard to find at full flood. Move through a narrow water way between the rock on your left and another rock on your right. Drop two anchors to fix your boat position first. Then bring your dock lines with the tender to put them on the bitts on rocks. 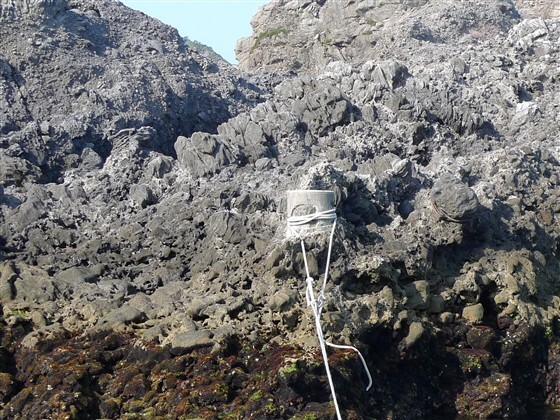 As the seabed of the cove is rock and sand, the anchor doesn’t hold well. 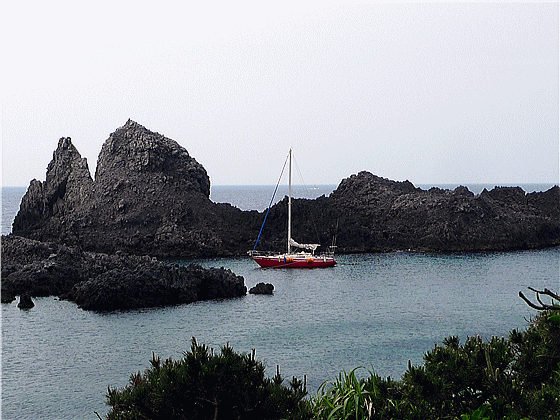 Once the anchor drags, your boat hits rocks around the small cove. So, even at anchor, you need to moor at the bitt with a bow line and/or a stern line. Even if you try to pull out the one end of the line around the bitt when you leave the cove, you won’t be able to pull out the line because of the friction between the line and the bitt. As a solo sailor, I left a line there last time. This time, I had thought the friction would be OK with a new line though, it was no good again. The solution: Put a loop line which can be left on the bitt. Then, moor at the loop line with the dock line. This time, I used and left a line with two eyes as you see on the pictures. The area of the cove is small. Its inside space would be full with five boats. It is getting shallow at the sand seabed in the back. Checking the depth meter and calculating the depth at low tide, decide the to-be-fixed boat position in the small cove. Around the bitt on your right, it is relatively deep. As the cove is far from the village, your mobile phone will not be connected well. While it is safe inside the cove, as waves roll in at the narrow entrance, you can’t get out the cove when westerly wind gets strong. 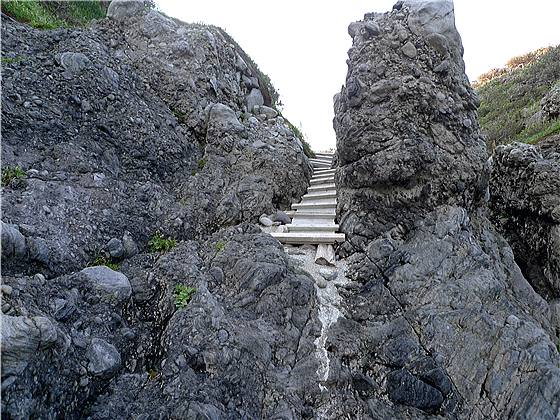 After coming ashore with the tender, you climb up a narrow pathway, which is overhung with vegetation between rocks. It is dangerous at night. The top of the pathway is an open space for a helicopter pad. No water nor no coin laundry nearby. A western style toilet with shower is above Tomari Port. Go out the helicopter pad area to a road, turn left and you will be there. Shikine-jima is an Onsen (spa) island. Ikoi-no-ie is a public bathhouse for JPY200.